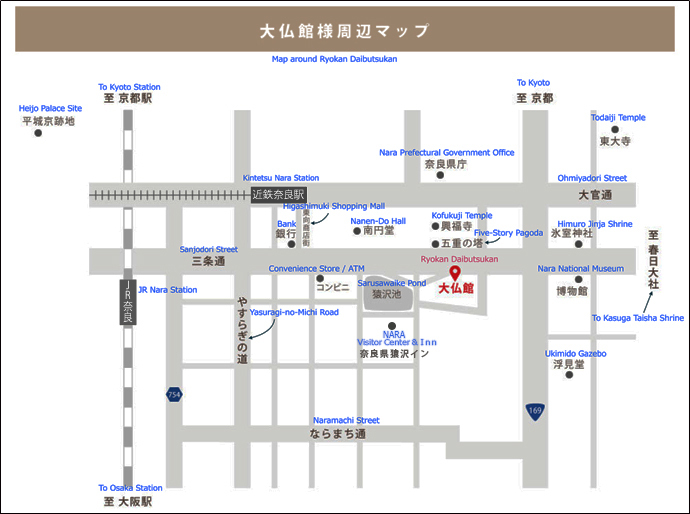 Ryokan Daibutsukan is located a 20-minute walk from JR Nara station and a 10-minute walk from Kintetsu Nara station. 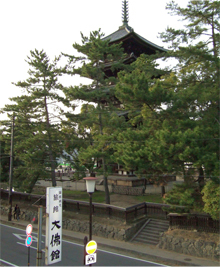 A World Heritage Site, the five-story pagoda at Kofukuji Temple, is situated in front of us. 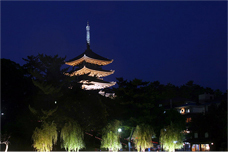 We are located in the heart of Nara’s tourism area. 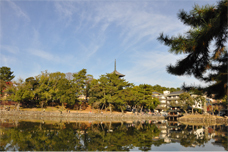 The tourist spots of Nara such as Nara Park, Sarusawaike Pond, Daibutsuden Hall of Todaiji Temple, Kasuga Taisha Shrine and the bustling Sanjodori Street are within walking distance. The guests may enjoy a morning walk in the historical sights. We offer 30 traditional Japanese TATAMI style guest rooms. Each room is provided with air-conditioning, minibar, TV and ‘washlet’ bidet toilets and is equipped with bath towel, hand towel, hand soap, body soap, shampoo & conditioning, toothbrush, YUKATA bathrobe, hairdryer and other amenities for free to use. station to JR Nara staion. ・20 minutes walk from JR Nara station. Namba staiton to kintetsu Nara station. 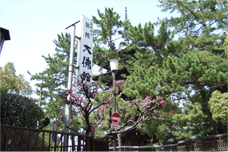 ・10 minutes walk from Kintetsu Nara staition. Copyright(C)2006 daibutsukan All rights reserved.